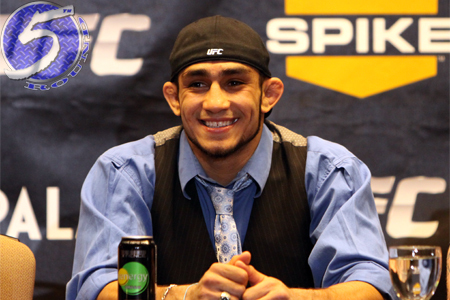 On Friday, the world’s premier MMA promotion added a lightweight bout between Tony Ferguson (Pictured) and Yves Edwards to “The Ultimate Fighter 14 Finale” roster. The December 3rd event take place inside the Pearl at the Palms Casino Resort in Las Vegas, Nevada. Ferguson, who was the winner of last season’s edition of TUF, broke in his six-figure contract by breaking Aaron Riley’s jaw last month at UFC 135. “El Cucuy” bumped his record to 12-2 following the TKO (Doctor’s Stoppage) victory. Spike TV will broadcast the card’s main bouts, which will be headlined by a middleweight shootout between Michael Bisping and Jason Miller.